TIME TO SAY ‘NO’ TO LESSER-EVILISM! Following the victory of Donald Trump on November 8, a number of prominent left-leaning liberals with a strong following in the labor movement — most notably Michael Moore, Robert Reich, and Arun Gupta — wrote articles about the Hillary Clinton debacle that contain valuable insights. But the authors go on to conclude that what is needed now is to “take back the Democratic Party from the rightwing Democratic National Committee (DNC) leadership who lost us the election.” Good assessment, wrong conclusion. All this is true. But instead of concluding that it’s about time for those unions that are getting hammered by the corporations (under the Democrats’ watch) to break with the Democrats and build their own independent political party, these liberal writers — Moore and Reich, in particular – simply propose more of the same: continued reliance on the Democratic Party. This is a dead end! Time to Say “No” to Lesser-Evilism! Both writers insist that the main task during the next two years is to push the Elizabeth Warren-Bernie Sanders wing to take back the Democratic Party and elect “reformers” to political office in 2018 at all levels. “It’s about 2018 – not just 2020,” they insist. Not surprisingly, both writers are silent about the key question facing working people today — which is the need for the labor movement to break its ties of subordination to the Democratic Party and build a working class party based on the unions and the communities of the oppressed. No. The Democratic Party has never been the party of the working class majority. The party is funded and controlled — from top to bottom — by the corporations and the capitalist class. Always has been. Decades upon decades of attempts to “reform” the Democratic Party have all failed miserably. All such efforts, moreover, have ended up demobilizing and derailing the movements for social change. In the name of supporting the “lesser evil” candidates, the mass movements have been taken off the streets and taken back into the safe channels (for the ruling class) of the Democratic Party. This issue is bound to surface in the coming weeks and months. Independent, Mass Action in the Streets! 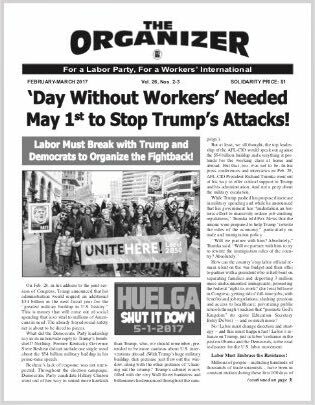 Activists are already beginning to call on the unions and the organizations of the Black and Latino movements to spearhead the resistance against the impending racist, anti-women and anti-worker attacks being prepared in Trump Tower. * stop the increased wars of intervention against working people around the world. Hundreds of thousands of people need to be mobilized in all corners of the country in support of all these and other struggles – either in the form of single-issue coalitions, or multi-issue coalitions. The time is now for mass action in the streets! But these actions will necessarily be blunted today, and they will be derailed tomorrow, by those Democratic Party reformers who support mass protest actions but insist that these must be framed and organized in such a way as to promote their legislative efforts to defeat Republicans in 2018 and 2020. No. The mass actions, to be successful, must remain broad-based and independent of the Democrats and their legislative agenda. The demands must be precise and uncompromising. Coalitions building these actions must be based on mass, democratic assemblies. Everyone who supports these demands is needed and welcome. But subordination to the Democratic Party, whichever its wing, is a recipe for disaster. The trade unions will need to take the lead in building these mass actions, putting their immense resources and membership to this task. It will also be important to reach out to white, working-class Trump supporters, who are in for a rude awakening when Trump — implementing the corporate agenda, as he will — begins slashing their healthcare programs, shutting down more factories and jobs, sending their sons and daughters to fight and die in wars in far-off lands, and leaving tens of thousands of them without homes and communities. But something else, something even more vital, is needed in the coming period if the working class and its allies in the communities of the oppressed are to reverse these attacks and prevail in winning their fundamental demands for peace, jobs and justice: The trade unions must break their ties of subordination to the Democratic Party and build an independent voice, an independent political party, of their own — in alliance with their Black and Latino allies. It’s Time for Labor to Relaunch a Labor Party Advocates-Type Organization! The trade union movement, though severely weakened by decades of reliance on the Democratic Party, still remains a formidable force. And its potential power, if unleashed from its subordination to the Democrats, is exponentially greater. Just in this election, the unions spent $400 million to support Clinton; SEIU alone put up $70 million. The unions mobilized tens of thousands of canvassers and knocked on 9.5 million doors, according to the AFL-CIO. They spent $40 million alone in registering new voters. 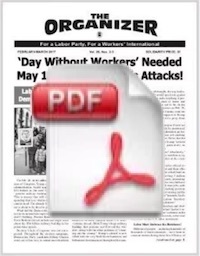 As we have stated time and again in the editorial pages of The Organizer newspaper, the number one obstacle facing working people in this country is the subordination of the leadership of the trade unions – the only organizations that represent and organize the workers on a class basis – to the Democratic Party. Helping to break the unions away from that vise-grip is therefore one of the central tasks facing independent labor activists. Working people are looking for alternatives. Nnamdi Scott ran as an independent Black working-class candidate for City Council in Baltimore and garnered close to 10% of the vote, with only a small and poorly funded campaign. What is needed are dozens of Nnamdi Scott-type campaigns around the country in 2018. What’s needed now is a national organizing committee, with labor, Black and Latino leaders at the helm that promotes a new political strategy for labor. Such a committee – modeled after Labor Party Advocates – would, of course, promote independent mass actions of resistance in the streets, but its focus would be to get the ball rolling to run genuinely independent labor-community candidates for local and state office in 2018. Follow the Example of the Cleveland 19 Trade Union Activists! “In 2008, the election of Barack Obama to the presidency, along with Democratic Party majorities in both houses of Congress, gave rise to hope for many people. However, no legislation was passed providing for a major jobs program, infrastructure spending, labor law reform, Employee Free Choice Act (card check), a labor-backed single payer universal health care system (eliminating the for-profit, parasitic insurance companies), increase in the minimum wage, or action to ensure a clean and healthy environment. And the list goes on. “The country also experienced growing income inequality over the past several years and the widespread cuts in pensions are driving more people into poverty. “Polls show 60% of the U.S. population favors the formation of a new, independent political party. Only 36% of eligible voters voted in the midterm elections. People are fed up with the two major parties and soundly repudiated the Democratic Party on November 4, a party we continue to support each election cycle with funding and boots on the ground. It’s time for a change! It’s time to develop an effective alternative! “The lack of a critical voice from labor and its allies in the electoral arena has resulted in a monopoly of power by the big corporations and their political bagmen, with Wall Street popping the champagne corks as a result of the November 4 elections. “Tough times lie ahead for the labor movement. What is urgently needed now, we believe, is a debate throughout the movement regarding what must be done to gain real clout in the political and electoral arena. Let those who advocate sticking with the Democrats (or turning to the anti-labor Republican Party) have their say. But let advocates of independent labor/community political action be heard as well. The time is now to take this Open Letter and transform it into resolutions to be submitted to unions and labor councils across the country. The time is now to hold a broad-based conference (or, if conditions permit, a congress) of labor and the oppressed to promote running independent-labor community candidates and moving the discussion around the need for a new political party of the working class majority – a party based on the unions and the communities of the oppressed. * Clinton won the popular vote by close to 3 million votes. * There was no Republican voter surge for Trump; he got roughly the same number of votes (62 million) as did GOP candidate George Romney in 2012. * Clinton received close to 4 million fewer votes than Barack Obama did in 2008. * Obama won Indiana in 2008, a state that was about 84 percent white then, and performed better among nearly every subgroup of whites in his two victories than Clinton did in 2016. In fact, Clinton suffered her biggest losses in the places where Obama was strongest among white voters. * Clinton lost despite the fact that she outspent Trump almost 2-to-1 and had the support of the politically active denizens of Wall Street and the top executives of the country’s largest corporations, and even former Republican President George HW Bush. * The Black vote was lower than expected because of the distrust in Hillary Clinton but also because in some states, such as North Carolina, the Republican officials imposed new restrictive voting laws targeting African American voters specifically. These laws restricted access to early voting. Also, there is “felony disenfranchisement” in countless states; the New Jim Crow laws ban prisoners and ex-felons from voting. The total is 3.9 million people who could otherwise vote. Trump has no mandate; he was supported by only 26.06% of the voting age population. Roughly one in four people over the age of 18 across the country voted for him. Top Democratic Party officials have lashed out at the abstentionists and third party voters. Colin Kaepernick, the quarterback of the San Francisco 49ers, gained great notoriety when — to protest the continued police killings of Black youth — he refused to stand during the pre-game national anthem. He took a knee instead. Kaepernick was raked over the coals by the sports media, the Democratic Party, and the political establishment. They accused Kaepernick of poisoning the minds of Black youth against the political system. The Democrats, including Clinton, had earlier gone out of their way to discourage people from voting for third parties, arguing that a vote for a third party was a vote for Trump.